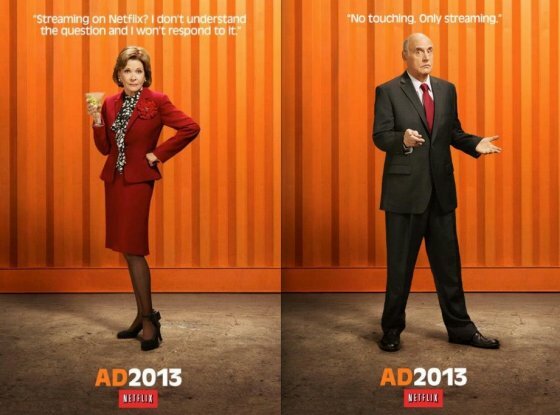 -As much as I love and adore Arrested Development, I’ve been a bit nervous about the prospect of a new season. I mean, it’s been seven years. Would they be able to recapture the magic? But this new outtake featuring Lucille and Buster has done a lot to restore my faith. The new character posters are also pretty damn glorious. -Speaking of Iron Man 3, expect it to be a monster at the box office. It doesn’t open for another week, and already it’s making up 25% of all movie tickets being sold right now. More than 400 screenings have already sold out. –Steve Martin was pretty adorable on Letterman this week, talking about being a new dad. -Speaking of late night TV, Tom Cruise should do all future interviews with Emily Blunt by his side. They’re pretty great together. -Here’s Beyonce’s new short film for H&M, directed by Jonas Åkerlund. Yawn. –Jimmy Kimmel chugged five drinks during his Time 100 speech and the results were marvellous. –Jennifer Love Hewitt may be brought on as a judge on The X-Factor? Who wants that? -The guest star list for The Office finale has been released. Steve Carell‘s name is not on it, but there’s no way he’s not coming back. –Edward Norton is being investigated for harassment after a heated run-in with a pap. –In this video, New Girl‘s Jake Johnson previews a big Nick and Jess moment in next week’s episode. -In case you were wondering, Rihanna and Ciara still appear to hate each other. –Grimes wants you to stop referring to her as a waif, ok? -If this royalty thing doesn’t work out, Prince Harry could have a promising career as a news anchor. -Just in case you didn’t find her annoying enough, Jessica Alba says she wore a double corset day and night to lose her baby weight. –The backlash against Zach Braff‘s Kickstarter hasn’t stopped him from nearly reaching his $2 million goal in just two days. -The guy who played Bunk on The Wire tried to make a prequel about the show starring Samuel L. Jackson. –Justin Bieber‘s unlucky streak continues. Drugs and a stun gun were found in his empty tour bus by Swedish police. Also, he’s getting flack for reportedly showing up to a photo shoot six hours late and refusing to change. –Justin Timberlake got all gushy about his marriage on Ellen. -You may not have heard of comedian Nathan Fielder, but that’s probably going to change this week. He just asked his Twitter followers to pull a drug dealing prank on their parents, and the results are hilarious. -The new trailer for Monsters University is pretty cute.